Nearly a year after the disengagement at Doklam, India and China have agreed to work towards full implementation of ongoing confidence-building measures along the disputed border, besides drafting a new bilateral Memorandum of Understanding (MoU) on defence exchanges and cooperation between the two countries. A report published in the The Indian Express stated that the the two sides also agreed to handle Doklam-like incidents with “sensitivity” and resolve them through “greater interaction at lower levels in the military”. This decision was taken on Thursday during bilateral consultations between the visiting Chinese delegation led by the Chinese State Councillor and Defence Minister General Wei Fenghe and Defence Minister Nirmala Sitharaman. The report further stated that the two sides agreed that Doklam-like incidents should be “handled with sensitivity, and handled with restraint, rationality and maturity”. These incidents, the two ministers were said to have agreed, must be resolved by mutual discussion and interaction at all levels between the two Armies. Both sides referred to the strategic communications issued to the two militaries following the informal summit between Prime Minister Narendra Modi and President Xi Jinping at Wuhan in April this year. “It was decided to expand the engagement between the armed forces relating to training, joint exercises and other professional interactions. Both sides also decided to work towards a new bilateral Memorandum of Understanding (MoU) on defence exchanges and cooperation to replace the MoU signed in 2006,” the Ministry of Defence said in a statement about the bilateral meeting. In order to ensure peace and tranquility on the border, both ministers agreed on greater interactions at the working level, including operationalisation of the hotline between the relevant departments of the armed forces, the statement said. Sources said that the long-pending issue of a military hotline continues to hang fire as India wants a hotline between the Director General of Military Operations (DGMO) at the Army headquarters in Delhi with the Chinese Army headquarters whereas China wants more than one hotline, which connects the military commands concerned on both sides. The matter has now been left for the officials to resolve among themselves, sources said. “This meeting was for the exchange of ideas which we will progress in field during flag meetings,” sources said, adding that the idea for having greater interaction at all levels — at unit and brigade level — came from the Chinese side. Officials from both countries will now work out a standard protocol for these meetings, sources said. General Wei is on a four-day visit to India along with a 27-member delegation, comprising key military officials. These include Air Marshal Dingqui Chang, Vice- Chief of the Central Military Commission and Lieutenant General Guiqing Rong, Vice-Commander of the Western Theatre Command which is responsible for the entire Chinese border with India. 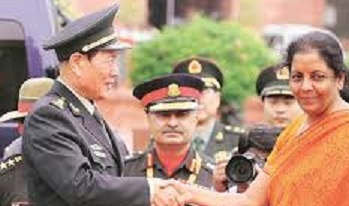 On Tuesday, General Fenghe had called on Prime Minister Narendra Modi who described India-China relations as a “factor of stability in the world”.